A series of gateway tabletop games from the best and brightest in the business, this is a must-back. Every year, tabletop games are becoming more advanced, strategic, and in depth. These games require tons of effort to put together, and many times, its all for naught. A game never picks up any traction on the market, and the producer is forced to move on. This has led many in the tabletop development community to flock to Kickstarter to get their games going. At any given time, there are hundreds of active game projects on Kickstarter, many of which are of the tabletop variety. Some of these projects, as you can probably imagine, are worth keeping at least a 10 foot distance from, as they reek of repetitive play, and generally underwhelming quality. Then there are the gems. These are the games that pull you in right from the get-go – the projects where you know you’ve found something special. This might be Exploding Kittens, or Blood Rage. Even the wildly successful Zombicide series was spawned on Kickstarter. Although being an avid tabletop gamer, I’ve only personally backed a few projects. I tend to want to actually play a game before I sink $20-$100 into it, and risk bringing a stink bomb to game night. That being said, as soon as I clicked the link that a friend had forwarded to me, I knew I had to back this one. 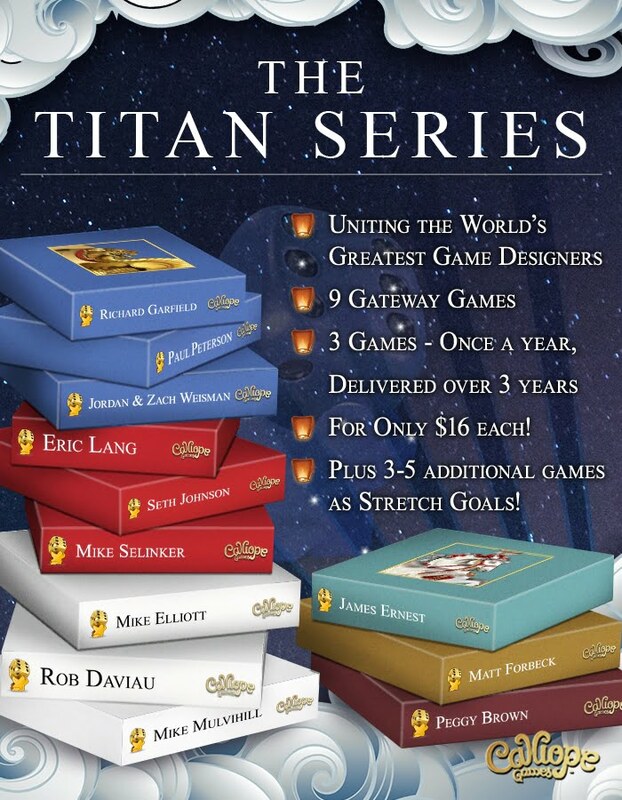 The Titan Series is a collective project from some of the brightest minds in the business. From the creators of Magic: The Gathering, King of Tokyo, Shadowrun, and much more, comes a series of gateway games. These are games that will be designed to introduce your friends and family to the wonderful hobby of tabletop gaming. When introducing someone new to tabletop games, the fastest way to send them running is to throw them head first into a complex game (like Aquasphere). They will become quickly discouraged, lose track of what they’re supposed to do, and leave with a sour taste towards the hobby as a whole. These gateway games are games designed to ease them in slowly, but still require a necessary amount of strategy if the goal (as it always should be) is to win. The Titans Series boasts an Avengers-of-Tabletop line up. This project is a fast, affordable way to build a diverse game collection (tabletop games of this variety typically run between $20-$40, but these are offered for only $16 a piece). Backers have the option of choosing to pledge for a specific amount of games, or all nine in the series. Each year, the group will send out three games from different genres. These include Worker Placement (The Big Cheese and Stone Age), Risk Management (Pairs and the upcoming Exploding Kittens), and Party games (Buzzword and Apples to Apples). Each game will be designed to be played with between 2-6 gamers, and will only take a maximum of an hour to complete (solving the always present problem of a single game dominating an entire game night). The Titan Series Kickstarter offers one of the best bangs for your buck, and looks to do wonders for the tabletop community. It involves a tremendous amount of proven talent in the creative space, and the final products look to be of the utmost quality. After only a couple days, the project has already been over 30% funded, and at the relatively low goal of $135,000, this looks like a sure thing to complete funding. I know one collector who couldn’t back it fast enough.